One of the highlights of this year’s Made in L.A. exhibition—the Hammer Museum’s biennial of contemporary L.A. art—is a pristine white structure on the museum’s mezzanine that resembles an ancient temple or a tomb. As you move closer and enter the installation, images begin to appear. 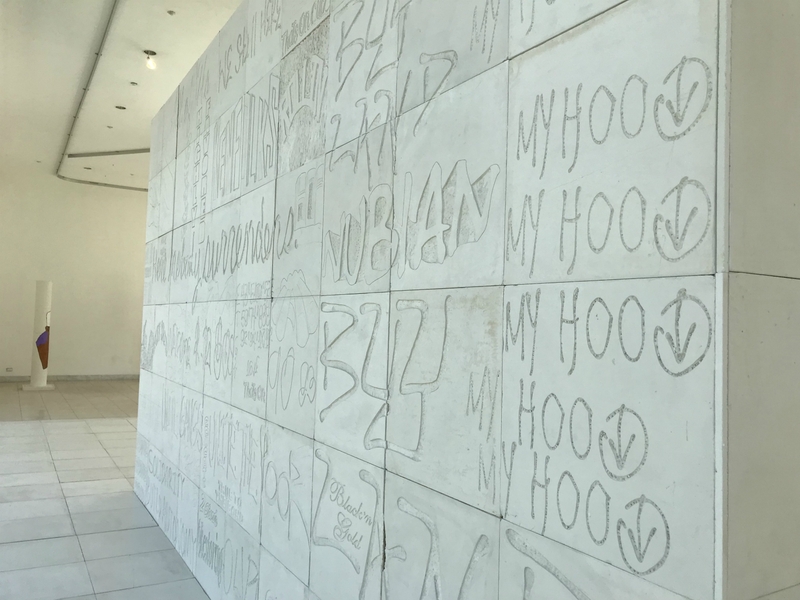 Carved into gypsum panels are scenes of African-American Angeleno life, bits of text from vernacular storefront signage, as well as authentic Egyptian hieroglyphics. Amid the vibrant montage, the names of African-Americans killed by police violence strike a somber note. The piece, titled The Crenshaw District Hieroglyph Project, is by 31-year-old African-American artist Lauren Halsey, who was born and raised in South Los Angeles. Despite its imposing size, the piece on display at the Hammer is merely a prototype for a much larger public art project that will be installed at a to-be-determined site in the Crenshaw District next year. Halsey’s process involves biking or being driven (she doesn’t drive) around South L.A. with her childhood friend and collaborator Emmanuel Carter, taking pictures of people, street scenes, and shops, which she then remixes and combines into new compositions to be carved into the panels. For the planned public installation however, she plans to elicit community input so that it reflects a range of voices. The roots of the project date back to Halsey’s 2015 residence at the Studio Museum in Harlem, where she created an installation that incorporated carved gypsum panels. Seeing it installed, she realized that she could make a free-standing structure with the panels, as opposed to having to rely on pre-existing architecture. 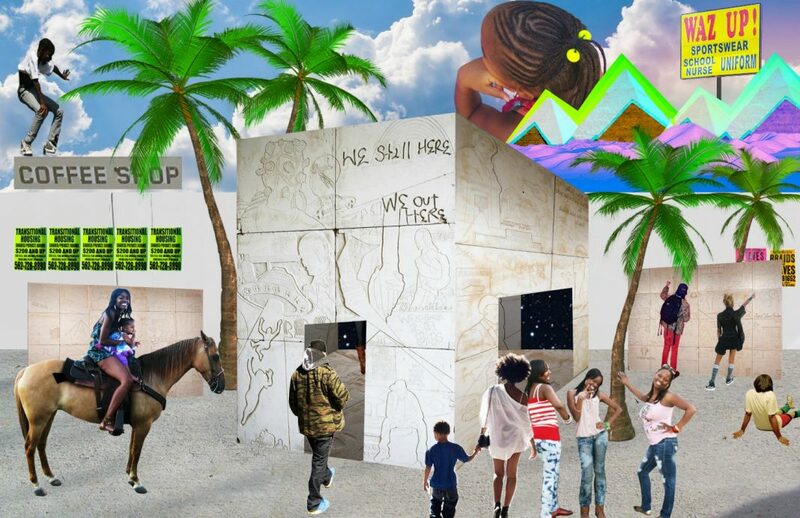 She then made colorful collaged renderings of an imagined public installation which she sent to city councilman Marqueece Harris-Dawson, who offered his support. She also raised over $18,000 through a Kickstarter campaign, which will be used to pay people who work on the project, something she is adamant about. With momentum building, she’s currently consulting with architects and engineers to determine the feasibility of her ideas. Instead of installing the gypsum panels themselves, she is planning to cast them in a more permanent material to increase their longevity. At this year’s Festival of Books at USC, she invited children to carve into gypsum blocks, a trial run for future collaboration. As she works out issues of production and process, her concept for the project is solidifying. She imagines four towers at each corner of the space, covered in images “describing iconographies, aesthetic styles, informal economies, leisure activities, celebrations, oppression, and local histories,” according to her Kickstarter. These will frame a central rock garden with a waterfall, and a place for seating where performances, workshops, and events can take place. This description recalls another work Halsey has on view right now, an Afro-futurist grotto-like installation at MOCA titled We Still Here, There that has changed and grown over the show’s run, also functioning as a communal performance space. We Still Here, There is on display through Sept., 3 at MOCA, 250 S. Grand Ave., downtown; Made in L.A. is on display through Sept. 2 at the Hammer Museum, 10899 Wilshire Blvd., Westwood.